So How Are Things At Sonoma Valley High? Lorna Sheridan wrote a very nice article in today's Sonoma Index-Tribune about Lynn Fitzpatrick, the interim principal at Sonoma Valley High. Lorna's a bright individual (not least because she went to Princeton) with a good deal of work experience in financial services (including American Express, one of my personal favorites). When it comes to understanding the educational arms race that admission to an elite university has become, she's a great go-to. Having said that, there's one line in the article that jumped out at me, and probably will for other readers as well: "... the high school’s standardized test scores lag behind other high schools in the area with similar demographics[.]" On the left is the graph of the Statewide Rank for a set of high schools around Sonoma Valley (Petaluma, Santa Rosa, Healdsburg, Napa). 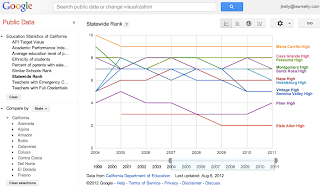 Sonoma Valley comes in at a 5 -- the same as Vintage, and the middle of the chart. About half of the time, Sonoma Valley does a little better than Napa High and Healdsburg High, and about half the time, a little worse (we're talking about single rank moves here). Maria Carrillo's way out in front (Austin Creek Elementary, the highest scoring elementary school in Sonoma County, feeds into Maria Carrillo). Elsie Allen (in Roseland, in Santa Rosa) and Piner trail here, which is more or less expected if you're familiar with the area's high schools. So Sonoma Valley's the middle of the pack, right? Well, not exactly. The data's more complicated than that. 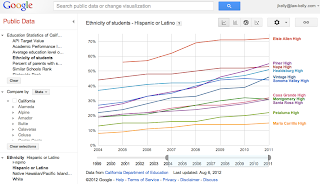 For all ethnicities, the scores at Sonoma Valley High are gradually increasing over time. 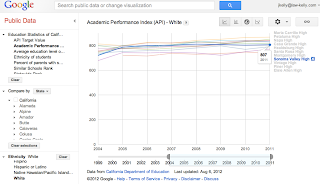 As an example, on the right is the API score of (their word, not mine) the "white" ethnicity at Sonoma Valley. 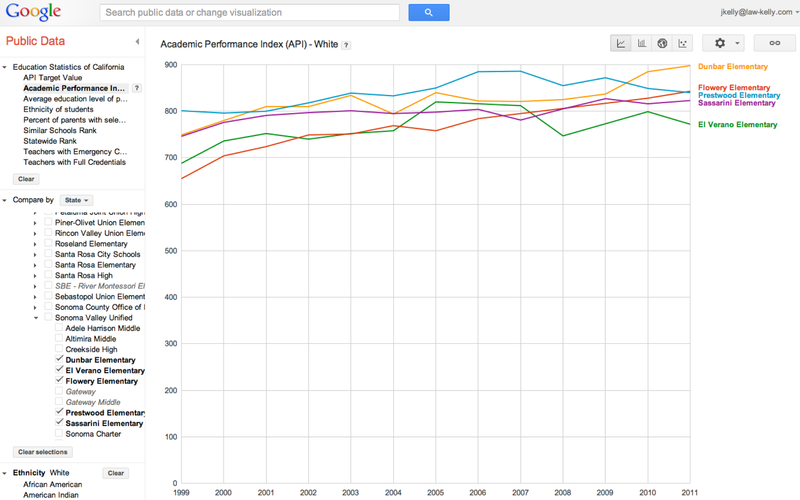 I've also selected the other, comparable schools in Napa and Sonoma counties. In absolute terms, the Sonoma Valley High students come in at an 807. 800 is the statewide goal, according to the California Department of Education. Interestingly, the schools clustered around Sonoma Valley High on this graph are two levels higher on the Statewide Rank -- Sonoma Valley's 807 and a 5 Statewide, while Montgomery is an 816 and a 7 Statewide. I think there are quite a few admissions directors at elite universities that would be surprised to find that the actual test score differences are so trivial. 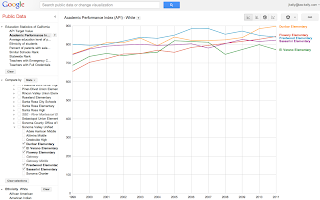 It is entirely possible for a ranking to decline while the API scores for all subgroups increase -- for instance, if there is a significant change in the population of the schools. The graph on the right shows that the change that appears in the elementary schools in Sonoma Valley is present here, too. To repeat my earlier post, I believe this graph obscures more than it reveals when evaluating a school's performance -- on the question of whether a school is improving or worsening in its job of teaching students, the percentages of ethnic groups at the school is irrelevant. Coming back to the main point, though, and as you might gather by now, I more or less disagree with Lorna on the condition of Sonoma Valley High. The differences between schools that are perceived as being stronger, or better, or "whatever" in relation to Sonoma Valley are insignificant -- those schools are actually turning in performances that are essentially the same for similarly situated students. The generalized sense that the local public high school is in "decline," which Lorna notes in passing, is, I think, really just a symptom of the budgetary chaos imposed on the schools since 1978 as a result of California's chronically dysfunctional state government. Physically, the schools have felt like they're getting worse, due to the significant amounts of deferred maintenance at several campuses, the aging athletic facilities, and the layoffs of the janitorial staff. I think it bears repeating, though, that the data shows that the teachers have nonetheless managed to improve student performance on standardized tests over the past decade. I am aware that this is in stark disagreement with conventional wisdom in Sonoma Valley -- but I am also aware that this improving performance is to the district's (deserved) credit, and while I was certainly prepared to concur with conventional wisdom when I started looking at this issue, the data just doesn't support those conclusions. 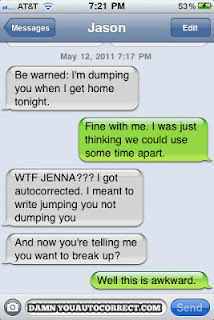 I'm frequently amused by the substitutions made by iPhones when they're trying to automatically make corrections. The phenomenon has spawned a series of websites, and one of the funnier posts I've seen is on the right. The reason I bring it up today is because of the posts I've been reading discussing the concept of "driverless" cars. There's been some talk on the subject in the last day or two from Paul Krugman and Felix Salmon. I've been thinking about it a bit because of the safety concerns that have cropped up here in Sonoma regarding pedestrians in crosswalks. By some accounts, the technology is now at a point where your car can detect whether someone's in the road (crosswalk) in front of you, and slow your car down, automatically. Further, the technology has the potential to dramatically increase the capacity of roadways through platooning, which has important consequences from an urban planning perspective. The Streets Should Fit the Trees. I was visiting family in Houston last week. Driving around, I couldn't help noticing signs like the one on the left. 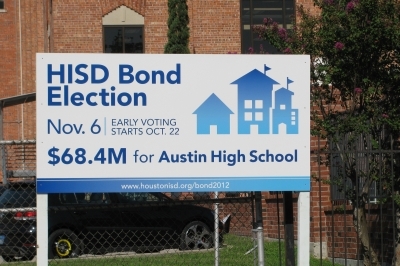 The Houston Independent School District went to their voters in the last election with a pretty big ask - just short of $2 billion. I had suspected the bond election had failed -- the generally accepted wisdom regarding education in Texas is that it's underfunded and lacks support. But I was wrong -- Houston came out 2-1 in favor. $2 billion is a lot of money, but it's good to keep it in perspective. HISD has over 200,000 students, while my little town, Sonoma, has about 4,600 in its school district. So for Sonoma, that'd be around a $40 million bond measure. Interestingly, Sonoma had a bond measure of about that size in 2010 -- Measure H -- and it received almost exactly the same support as the Houston bond. Texas' unemployment rate at the time of the Houston bond measure was 6.1%. California's at the time of Measure H was 12.2%. 6% unemployment is right about what (monetarist) economists generally think is the (suspected) value of the NAIRU, or the non-accelerating inflation rate of unemployment. This is basically the level of unemployment that keeps a lid on inflation. In the most simple terms, monetarists argue that some unemployment is a result of people doing things like switching jobs, and not because the economy is underperforming, and that if unemployment's at 6%, the economy's probably operating fairly normally. Thus, there aren't a lot of politicians that get terribly excited (worried?) about 6% unemployment. 12.2% is entirely different. 12.2% is considered disastrous. American Conservatives (well, at least the Wall Street Journal) argue, for example, that the French economy is in a severe crisis, with stagnant growth, steadily rising per unit labor costs, and chronically high unemployment. However, France's unemployment rate has never been over 11.5% -- at the time the Wall Street Journal wrote those words, it was 10.1%. You can imagine what those editorial writers think of California's economy. Most people reading this will see where I'm going, but it never hurts to spell it out: Sonoma's voters approved their bond measure in the middle of an economic collapse. What would the voters support if the California economy was turning in a performance like that enjoyed by the Houston voters? This segues into a broader issue, though. While economics and education generally aren't linked in discussions in California, improving schools and reaching out to students can only help so much when the child's parents are out of work. In 2009, Ann Huff Stevens and Jessamyn Schaller of UC Davis published a study that examined the relationship between parental job loss and children’s academic achievement. 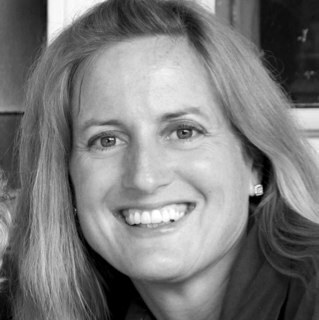 In 2011, the Washington Post's Suzy Khimm drew attention to the story. The research carefully controlled for distorting effects, and after doing so, determined that parental job loss increased a child's chances of being held back a grade by 15%. After properly excluding any other possible causal factor, the study determined that the effect completely disappeared if the parent had simply been able to get a new job. While the study's metric was solely students who failed a grade, I think it is safe to conclude that the decrease in academic performance is probably far broader. I can hear Captain Obvious in the audience, thinking to himself "John just proved that a parent losing their job can screw up their kid's life!" So what's the point? A lot of people sense that the economy has problems, but they're unclear on the specifics. Why does the economy have problems? 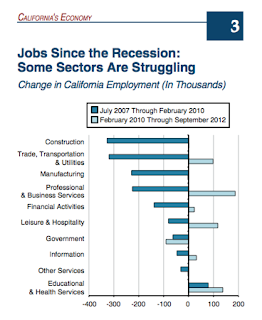 In aggregate, the problems faced by California are really linked to a couple of sectors. Since 2007, California has lost nearly 900,000 jobs in construction, manufacturing, and transportation. Perhaps 100,000 of those jobs have come back since 2010 -- but none have been in construction or manufacturing. Manufacturing's losses are significant but I think they're not as directly relevant to a place like Sonoma as they are to, say, Los Angeles. Los Angeles (surprisingly to many) is home to lots of manufacturers -- in everything from clothing to aerospace to jewelry. LA's problem is not Sonoma Valley's problem. Sonoma Valley's problem is construction. The easy rejoinder there is "well, there's been a collapse in real estate values, what do you expect? Nobody wants to build houses." That argument might work for the State at large, but Sonoma Valley's home prices have done better than average, and there are substantial efforts to engage in new construction, particularly concerning facilities that cater to tourism (leisure & hospitality), professional services, health services, and agriculture. There's even some home construction (especially remodeling) going on. Businessmen and women are trying to get things done. Instead, in nearly every single instance, the same set of issues are coming up over and over again. As a practicing attorney, I can tell you that each project that someone comes to talk to me about has (or, invariably, will have) the same basic problem, which causes intelligent and hard-working businesspeople to throw up their hands and oftentimes abandon the entire effort. That issue is California's thicket of minor legislation. The problem is not a new one. In 2004, The Economist newspaper (magazine) wrote an article on the condition of California's economy, after the dot-com collapse but before the housing implosion. To summarize their conclusions, unlike some other states in the U.S., there are different layers of overlapping government in California, and often those governments work at cross-purposes. The survey noted that places like Texas offer businesses one-stop shops, but that California presents more of an obstacle course. The authors pointed out that while costs are a problem, the bigger problem is generally unpredictability, with the sudden imposition of new rules (and charges) causing projects to slow down or to stop altogether -- the destructive consequence of the thicket of minor legislation. I see this going on nearly every day. From urban infill to brownfield redevelopment to simple remodel projects ... even habitat restoration efforts run into a near-impentrable maze of agencies and authorities, whether local, county, state or federal in nature. Guiding projects through this effort is, of course, what lawyers do, but from experience, I know that business depends on understandable rules, and our government generally fails us -- that we fail ourselves -- in that department. No one wants to make Thneedville's mistake in Sonoma Valley, or indeed anywhere in California. Our natural endowment is why many of us are here in the first place. That's not the issue. Reducing the impact of the thicket of minor legislation when we seek to maintain existing structures or reuse already-developed sites would substantially benefit our local economy, and start strengthening the economic base that can provide increased financial support for our schools. I can tell you that the Economist is on to something when they point to the thicket of minor legislation as the problem holding back the State -- and ultimately, holding back our efforts to improve education. Which really brings me to my final point. In 2009, my City decided that nearly every single tree on my street should be cut down -- no joke! If there's one issue that can really get my (and my wife's) attention, it's someone who wants to chop down trees without a (very good) reason. After looking at the plans the City put forward, I pointed out at the City's public meeting on the issue that the City was trying to make the trees fit the street, when what the City really should have been doing was making the street fit the trees. The problem that both my Valley and my State have encountered is that the economy and education, like the streets and the trees, need to fit one another. We should not forget that one is more important than the other -- but we also have to pay attention to both if we want to be able to take care of either. A Society Can Be Judged By Entering Its Prisons. Jerry Brown has my attention today. He declared that the emergency conditions in California's prisons have ended. Brown credited realignment, which has basically meant shifting state prison inmates to the county jails, with reducing the scope of the problem. I've blogged about it previously, noting that the remaining portion of California's budget deficit can largely be explained by the requirement that 10,900 prisoners will be housed in out-of-state prisons in 2013, in order to deal with the overcrowding emergency. From a budget perspective, if Jerry Brown can get the federal courts to agree that the prison capacity crisis has ended, and allow the Governor to move those prisoners back into the State's prisons, he will have balanced the California budget this year. 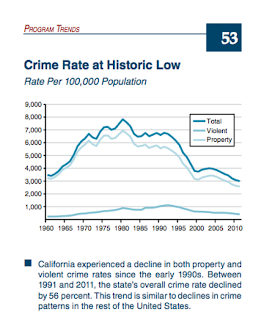 "Crime Rate at Historic Low"
The problem Jerry Brown's discussing, while it is unlikely to be solved by the judges going along with his proposal, is one that it appears will be resolved as a result of other factors in the next few years. The recent changes to three strikes, combined with realignment, have helped. But the graph on the right is really what's driving the situation. 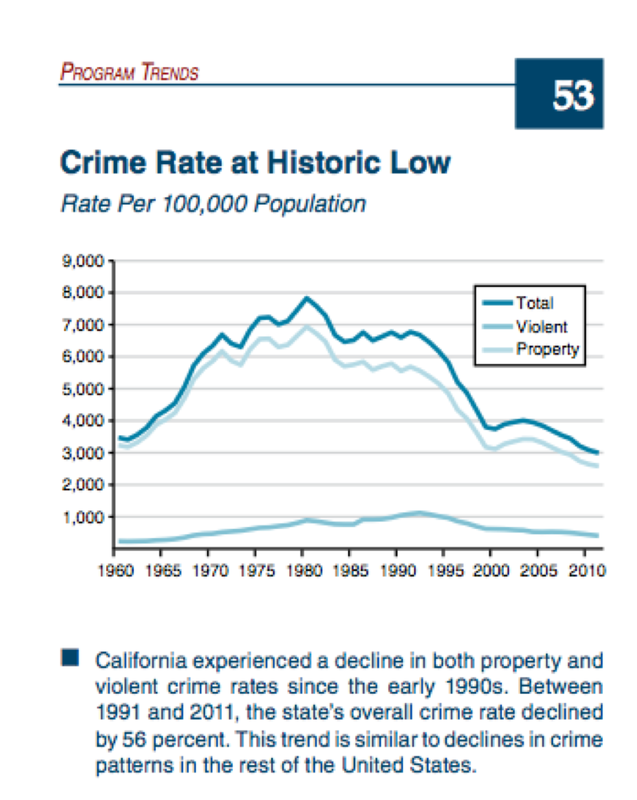 California, like the rest of America, faces continued declining rates of crime. As Richard A. Oppel, Jr. of the New York Times pointed out two years ago, no-one really knows why this is the case. If anything, most experts had expected crime to pick up during the recent economic crisis, but the opposite actually occurred. I don't have any particular insight to why this has happened, aside from noting that whatever's causing it, the same phenomenon is occurring next door in Canada. Brown's quotes are specifically interesting, though, because Jerry Brown almost certainly knows he's telling a whopping lie by saying California has "one of the finest prison systems in the United States." 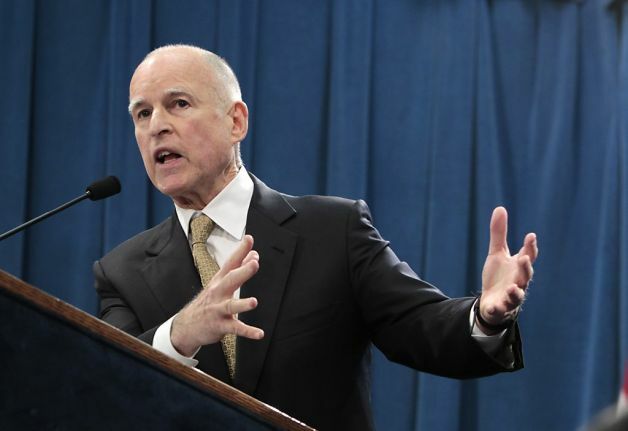 Brown is navigating through the last portion of what was a near-meltdown of California's government. To paraphrase Viscount Snowden, truth is the first casualty in a crisis, and Dostoyevsky's observation that "a society can be judged by entering its prisons" is as true as it ever was. California's prisons are institutions that, like the State, are stepping back from the precipice of an economic collapse. Things have gotten better, yes, but calling California's prisons the nation's finest is, rhetorically, almost certainly a bridge too far. Dan Walters and Education Funding. 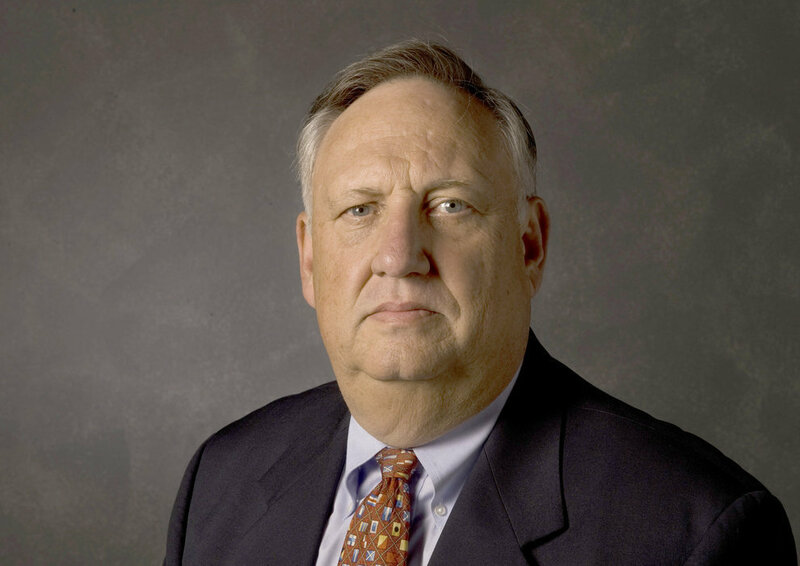 Dan Walters is a columnist for the Sacramento Bee. While he's not exactly eye-candy to look at, his columns are a great resource for understanding what's taking place in Sacramento. He's a bit iconoclastic and isn't beholden to any particular interest group, so I read him to get an idea where California's going politically in the next 12-24 months. He's behind the curve right now, simply because the story has changed so much in the past two months. But he's catching up. 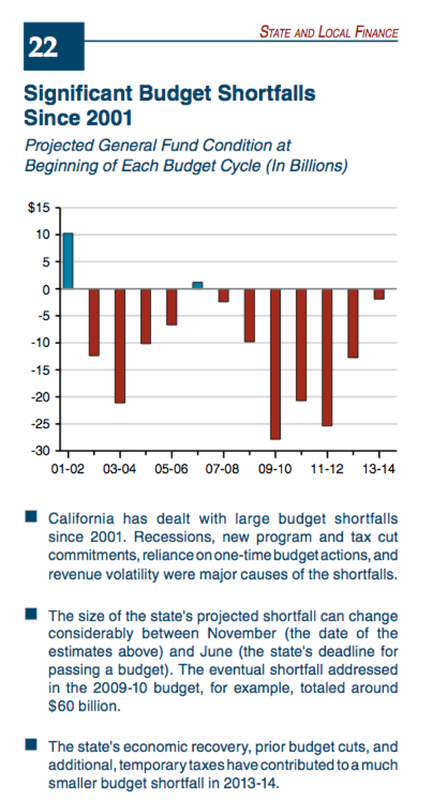 His column today notes that the California budget situation has gotten much better (this after the Legislative Analyst reported the same two months ago), and that the new issues in the new year are, amazingly, going to revolve around how to spend revenue, rather than how to impose cuts. "Significant Budget Shortfalls Since 2001"
This will not be a small fight, particularly because, as he's noted over the past week, there are also serious and substantial efforts to revise Prop. 13. Further, at the same time, Jerry Brown is attempting to change the funding formula for the educational system. This would involve, crucially, increasing funding for ESL programs, which would be significant change for, at a minimum, schools facing a changing demographic profile. Dan points out these changes are possible because of the Democratic supermajority in the legislature (something that may not last long). I bring it up to note that, for many Californians, the story regarding education has generally been nothing but cuts for a decade, perhaps longer. This has led to fatigue -- the constant crisis has frustrated many, leading to a certain sense of defeatism concerning the ability of the State, ever, to provide adequately for K-12 education. I sympathize with anyone that thinks that -- California politics have been anything but functional for thirty years and there's a sense that's crept in that the State will always be this way, and that serious change (let alone reform) is beyond the political's system's reach. However, this time, it really does look like it's going to be different. of the May 29, 1919 solar eclipse. The photograph at the right is probably the most important one taken in the 20th Century. 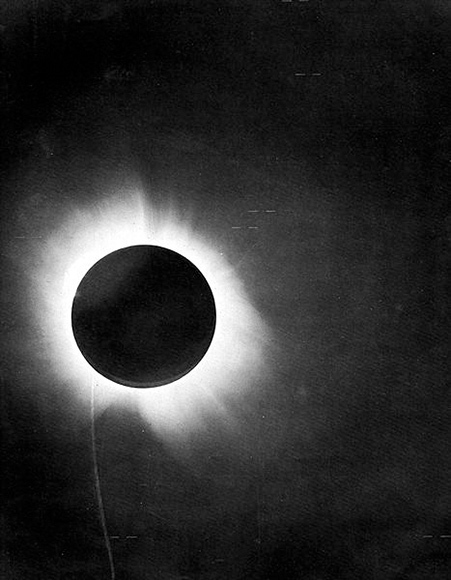 It was taken of an eclipse of the Sun by Arthur Eddington, on May 29, 1919, from the island of Príncipe in the Gulf of Guinea, off the west coast of Africa. In the upper right portion of the Sun's corona, you can make out a small dot, which is the Hyades star cluster. The reason it was so important, was not because the position of the Hyades star cluster was wrong, although that was definitely the case. The Hyades star cluster has "moved" in this photograph when compared with all of the other stars in the sky -- but the problem was that it moved too much. Isaac Newton had predicted hundreds of years before that gravity could bend light. He had even predicted how much the light would bend. But in this rare instance, Isaac Newton was wrong -- the light from the star cluster had moved twice as much as he had expected. But someone else's theory was right -- a former Swiss patent clerk by the name of Albert Einstein. The apparent movement of the Hyades star cluster was exactly the amount that Einstein's theory predicted when light traveled near the warp in spacetime induced by the Sun's gravitational field. OK, nice story, what's the point, John? This post isn't about relativity, or even really astronomy. It's about how this experiment was possible in the first place. The Moon, in an eclipse, functions as a natural coronagraph. Like any coronagraph, the moon allows the viewer to see the light from the corona of the sun (and the light from the Hyades star cluster), which would otherwise be hidden in the Sun's bright glare. Without the moon being in this position, measuring the degree of the apparent movement of the light (and the proof of general relativity) would have been well-nigh impossible. Why am I talking about this today? Well, over the past week or two, I've been looking at the test scores for Sonoma Valley's elementary schools, trying to develop a picture of what's taking place from the data. In my last post, I used a very limited set of data to illustrate a point -- the overall rankings of the schools measured by API scores, and then the scores of a particular subgroup across different schools over time. Those two pieces of data point in different directions. In talking over some of the comments made by some very intelligent people who reviewed the post on Facebook, it became clear that they were aware that I was using something akin to a "social science coronograph" to block out a particular piece of data, which was so bright and glaring that it would make it impossible to view what I'm really interested in. I deliberately blocked out that piece of data, because, like the Sun itself in Arthur Eddington's experiment, it obscures more than it reveals. But I don't want anyone to think I'm hiding the football here -- far from it -- it's just that this particular piece of data drowns out the signal. 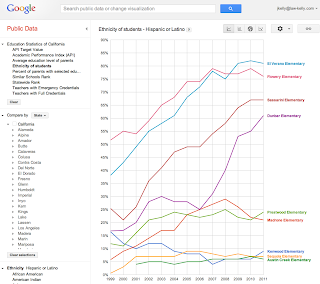 That piece of data is the graph at the right. 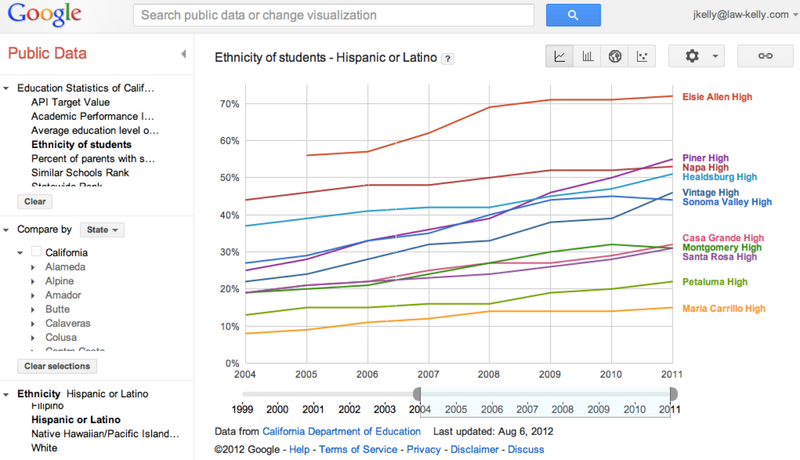 It's the percentage of the population at each elementary school that is Hispanic or Latino. This graph is essentially the reverse of the API score decline graph I posted yesterday. 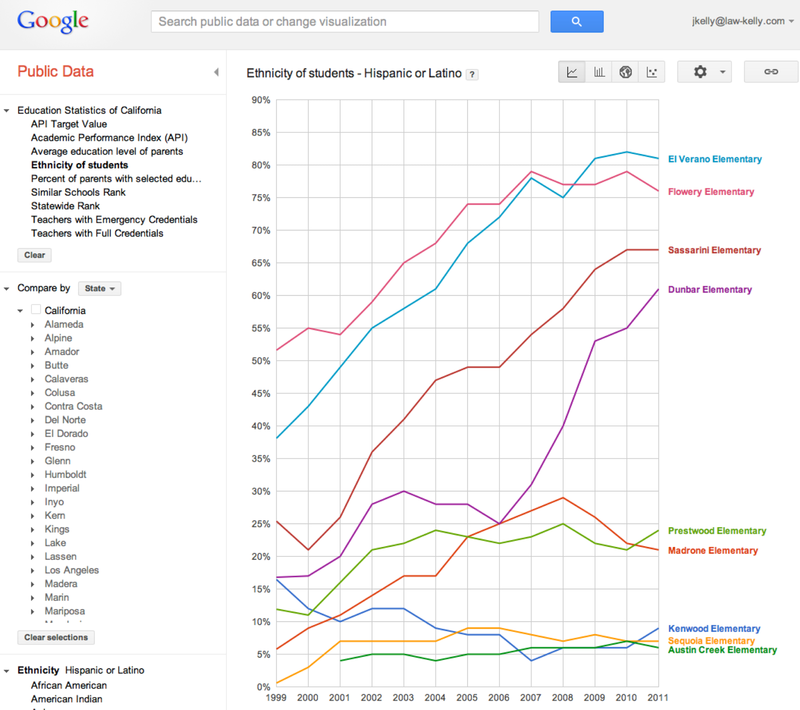 Google's setup isn't letting me graph ESL students, but the graph is essentially similar when you review it at the State of California's site. This demographic change happens to make the API scores vary wildly, which was one of the big reasons I picked a narrow subgroup when evaluating the schools over time. As you can see from the data, Sassarini, where I'm thinking about sending my daughter, is about 2/3rds Hispanic or Latino as of 2011. That's not a drawback from our family's perspective. My wife and I have been making an effort to ensure our daughters have the opportunity to learn Spanish, and perhaps the great overlooked point in learning a language is that you need to listen to it. The fact that our daughter would thus be exposed to a great deal of Spanish on the playground is, frankly, a positive. I am, however, aware that there are parents that disagree. But on the question of whether a school is improving or worsening in its job of teaching children like my daughter, the ethnic makeup of the school is irrelevant. And that's why, in making that determination, I pulled out a virtual coronagraph and blocked the glare from this graph ... it's not something that is inappropriate for consideration -- it's just that I don't think it reveals anything about the statistical performance at a particular school, and that's the thing I'm interested in measuring at this point. There's a second issue that some of the comments were pointing out. This was the fact that I left off the charter schools on these graphs, and that I didn't point out the scores of some of the specialty programs that exist in the school district, such as the dual immersion program at Flowery. The second point is more straightforward to address than the first -- the dual immersion students appear to be included in the raw Flowery numbers. The first point is nuanced. The charters have unusual characteristics -- for instance, Woodland Star is a Waldorf school, and trying to measure a Waldorf school via something like an API score would be pointless and ultimately deceptive. If you want to understand a Waldorf school, you're going to need to meet the families involved. I can tell you from experience that I am impressed with the Woodland Star families. So, I would toss out the API score as a measure completely when evaluating Woodland Star. Sonoma Charter has a similar problem, but in the opposite direction. Sonoma Charter's Hispanic/Latino numbers are consistently around 15%, which is generally about half that of Prestwood. When that issue is adjusted for, the remaining 16 point differential between the students at the two schools is modest at best and is probably irrelevant. But as a parent who takes Spanish education seriously for my kids, my evaluation of the quality of the school is impacted by the skewed characteristics of the population of the student body. Finally, on the point of whether test scores are a good thing for parents to look at -- I think they reveal a lot of things, many of which were not necessarily intended by the creators of the test. Teaching to a test is always a concern, and a well rounded education is a means to an end -- the ability to function as an informed citizen in modern society. Cram courses to learn how to fill out little bubbles on a Scantron can improve test scores but do little in terms of educating children. However, there are a lot of parents in Sonoma whose children will probably go on to national-level (if not international level) institutions for postsecondary education, and dealing with the reality of standardized testing is a necessary part of preparation for navigating those institutions. Scores should be taken with a grain of salt (or ignored completely when evaluating specific programs), but ignorance of the nature of the testing regime is probably more dangerous for parents and children in the long run. 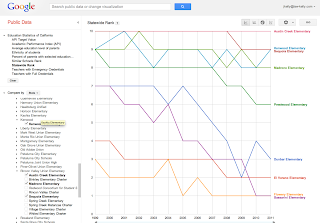 Sonoma Valley's Elementary Schools Are Better Than Ever? As most parents are unsurprised to learn, almost all students in California's elementary schools are tested annually. Based on those test results, every school is assigned an Academic Performance Index score (API) from 1 to 10. Those scores are available on the Internet. 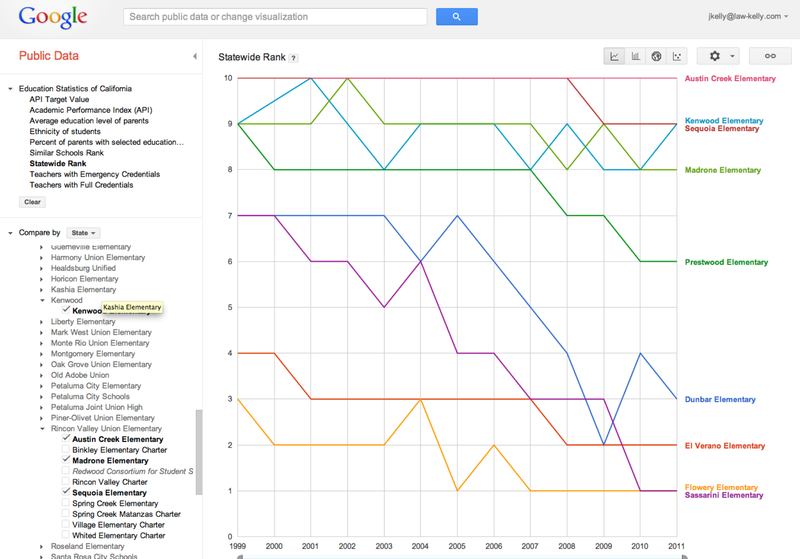 Google's taken that data, and has integrated it with a web application called the "Google Public Data Explorer." I have a 5-year-old daughter starting kindergarten in 8 months. Our neighborhood school is Sassarini, in the Sonoma Valley Unified School District. 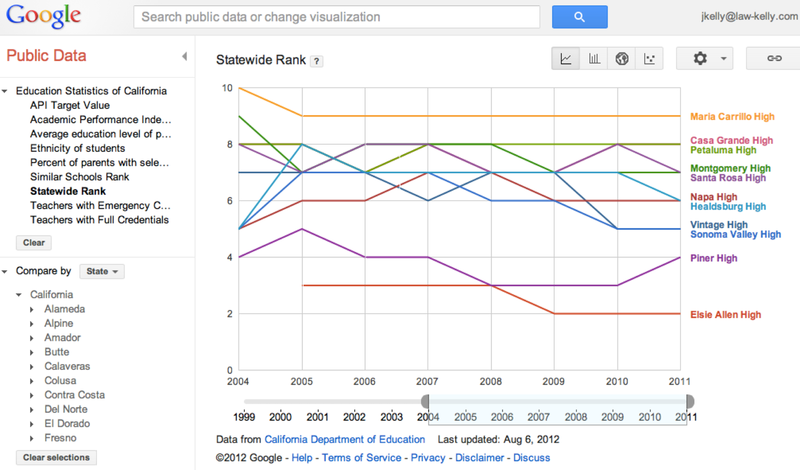 I've used Google's service to make some graphs of the performance of Sassarini in the state rankings over the last decade. Sassarini starts at a 6 when I bought my home in 2004, but as of 2011, it has declined to a 1. The drop in apparent quality isn't limited to Sassarini -- all the rest of the schools in Sonoma Valley show the same decline. Even Prestwood, generally considered the best public elementary school, has dropped from a 9 to a 6 in that time period. For comparison's sake, I reviewed the condition of the schools north of Sonoma Valley -- the schools in Kenwood and Rincon Valley. None of those schools is below an 8 on the statewide rankings. Austin Creek, the closest Santa Rosa school to Sonoma Valley, is a 10. Given the relative decline of the Sonoma Valley elementary schools in statewide rankings, I'd therefore expect that students at Sassarini who are similar to my daughter will, in general, score lower over time on standardized tests. But the data says I'm wrong. 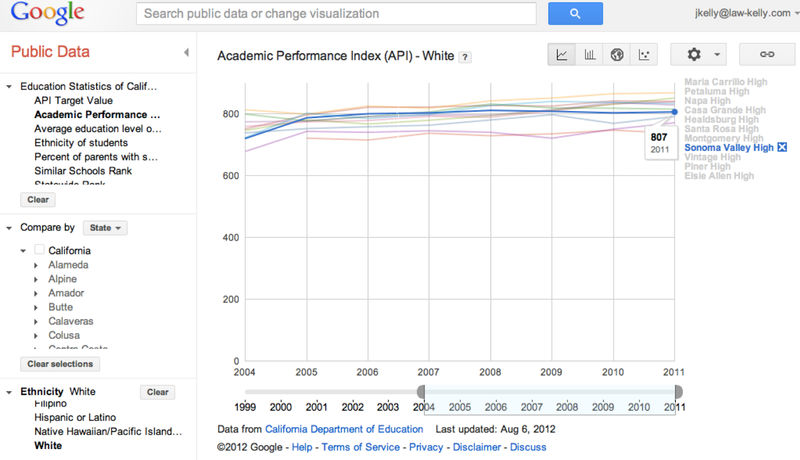 The graph on the right demonstrates the API score for each school in Sonoma Valley, for the "white" ethnicity. Flowery's at 843, Prestwood is at 840, and Sassarini is at 823. These are essentially equivalent scores, and all of them exceed state requirements. And all are higher than they were a decade ago.